Right from the start we knew that Tara and Brent’s wedding photography was going to be a very special day. The beautifully rural Bringalbit Farm – located about 10km out of Kyneton in country Victoria, was the perfect location for their vintage styled ceremony and reception. The farm is 10 acres of gorgeous orchards, rose gardens and rustic boulder landscapes, and suited their wedding theme right down to the ground. Our day started with Fi & Mandy photographing the dashing groom and his groomsmen, all of whom had been given creative licence when it came to accessorising their simple white shirts and neutral strides – we love the image results! Brent later added a brown waistcoat and feathered buttonhole – a lovely twist on the groom wearing a flower on his lapel. While the boys were playing pool, Tara and her girls enjoyed a pre-wedding drink, and began bridal preparations. A stunning arrangement of vintage roses and leaves (by Gisborne Cottage Flowers) was entwined through Tara’s hair. We photographed her bouquet sitting atop her grandmother’s vintage red suitcase – a beautiful ‘borrowed’ family heirloom with lots of sentimental value. was time… With Brenton waiting & their guests assembled in the Bringalbit gardens, Tara and her father made their way down the aisle. And then they were Husband and Wife. 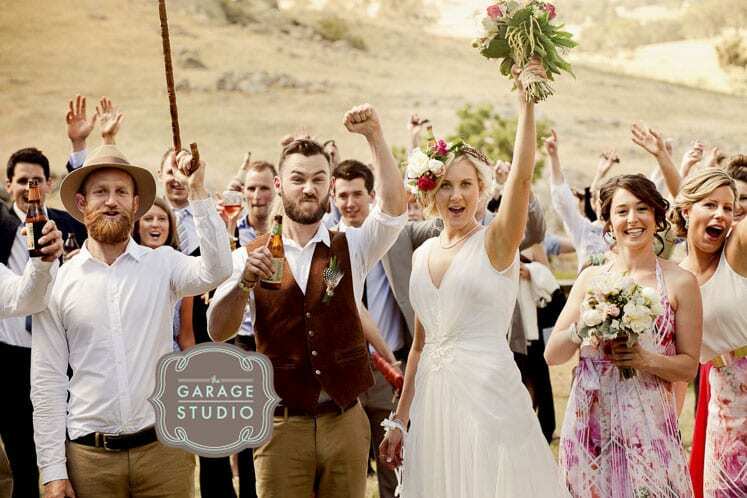 Tara & Brenton, congratulations on your marriage, and thank you for choosing The Garage Studio to be your wedding photographers!